Belfast, Maine was selected in 1996 to receive a Grammy award, presented by mid-western travel writers to America’s premier destinations. The area is well known for its exceptional crafts, arts, antiques and Greek revival architecture. Belfast was named after Belfast, in Northern Ireland around 1770. 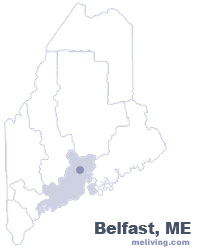 To share any Belfast, Maine information with us, please contact us. Learn more about advertising in MELiving.